Street level detail covering the communities of: Dunkerton, Elk Run Heights, Evansdale, Gilbertville, Hudson, La Porte City, and Raymond. Also including Black Hawk County, and the University of Northern Iowa campus. 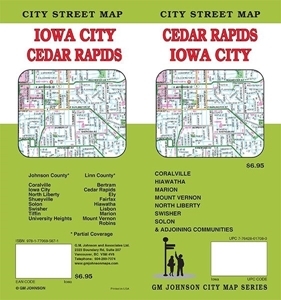 Map opens to size: 28" x 40"
Street level detail covering the communities of: Coralville, Fairfax, Hiawatha, Lisbon, Marion, Mt. Vernon, North Liberty, Robins, Solon, and Swisher. Also including campus maps of Coe College, Cornell College, and the University of Iowa. Map opens to size: 28" x 40"
Street level detail covering from Aurora Ave to the north, to Pine Ave to the south. From W 68th St to the west to E 43rd St to the east. Also includes an inset street map of Ames, as well as regional map of Des Moines & Vicinity. Map opens to size 17" x 18". Street level detail covering the communities of: Dubuque, Muscatine, and Clinton, and the campus maps of the University of Dubuque, Loras College, and Clarke College. Map opens to size: 18" x 25"